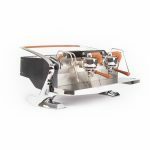 Kees van der Westen has been producing cutting edge espresso machines for over 20 years from his location near Amsterdam in the Netherlands. 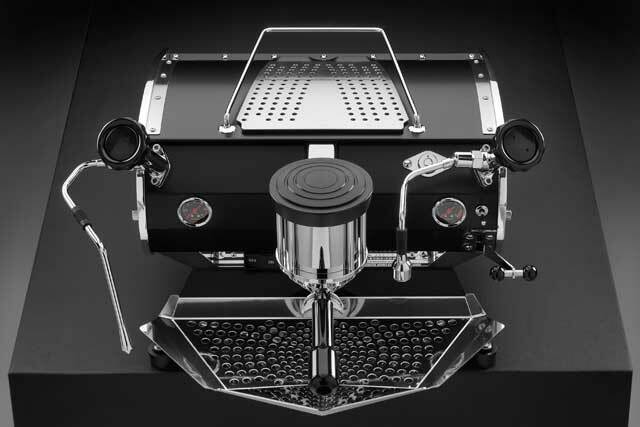 Designer of many iconic machines, Kees has channelled all his accumulated experience into the Speedster, Mirage and now the new Spirit multi-boiler masterpiece. 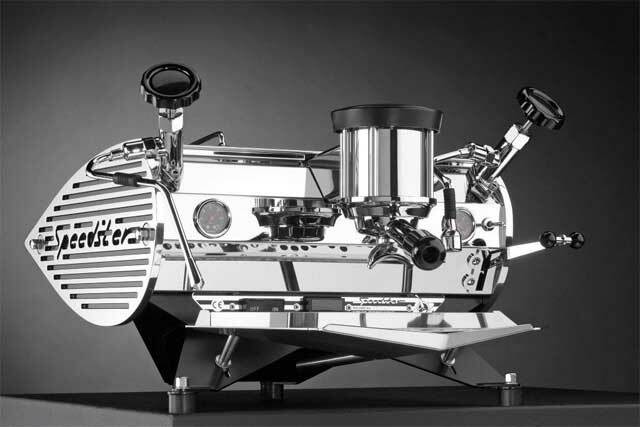 The vast advantages of Kees machines are conferred through exceptional thermal stability and radically beautiful industrial design. 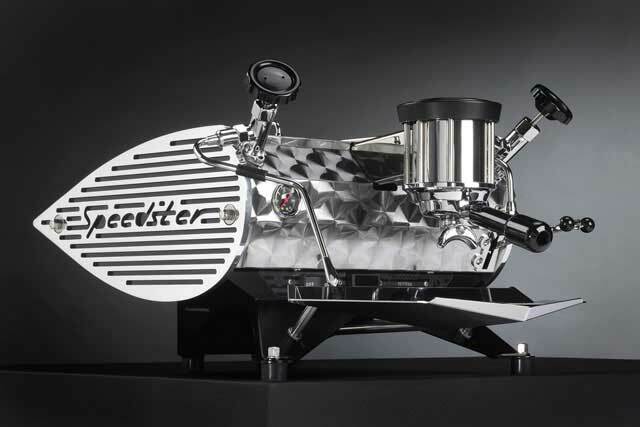 Few things add more presence to a cafe than a handcrafted sculpture in metal and glass, which has the leading technology and no-compromise build quality required to produce rich, powerful espresso all day under the busiest conditions. 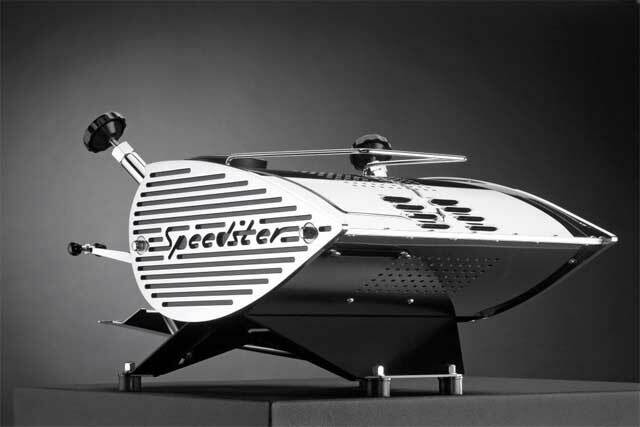 The Speedster is one of the finest single group machines available today. 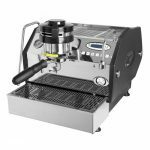 It combines multi-boiler technology with user programmable PID control for the brewing water, low pressure variable pre-infusion and the most stunning styling of any machine on the market. 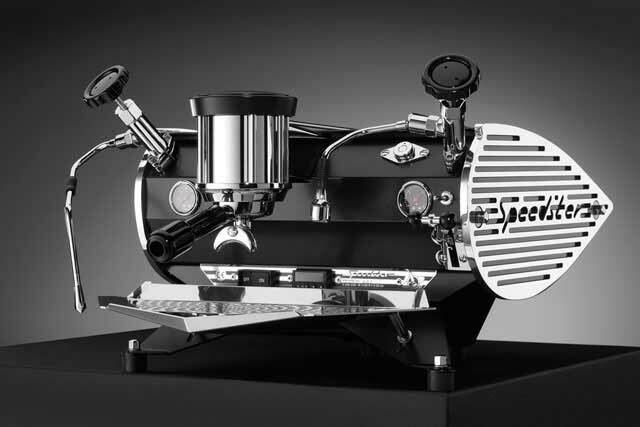 Completely hand built to order and with a long list of custom options. 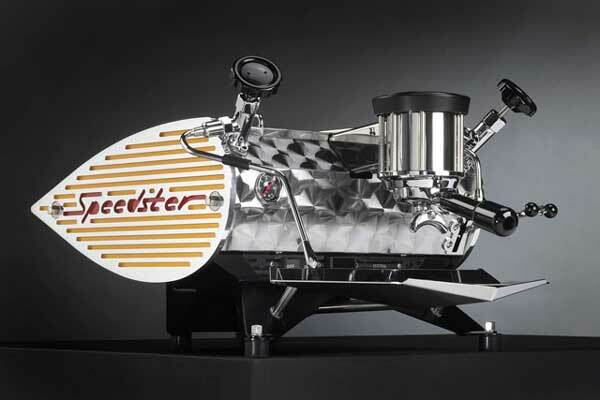 Completely hand built miniaturised commercial quality machine. 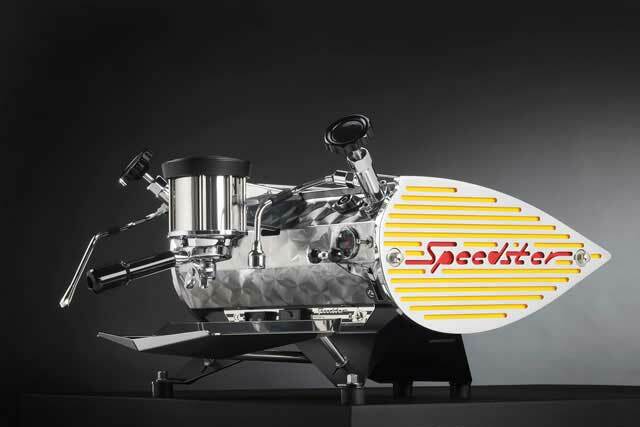 All parts custom designed for the Speedster by Kees van der Westen. Utilises dual-boiler system with saturated group head operating as part of the brew boiler, offering remarkable thermal stability and temperature control in a small boiler machine. 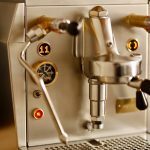 PID electronic control for fast user adjustable brew water temperature. 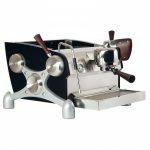 Coffee quality equal or superior to any commercial machine. 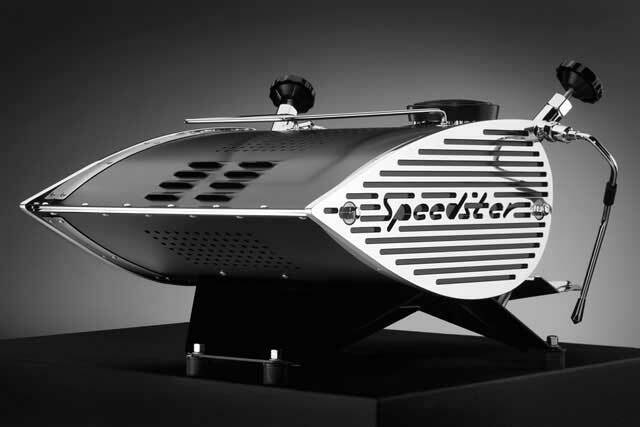 Unique hand crafted design and premium quality materials make the Speedster a long term investment of which you can be truly proud. Huge variety of options at extra cost to customise appearance and performance. Boiler Capacity Brew 2.1L, Steam 3.5L both thermally insulated stainless steel. Extra cost optional features: Available via order. 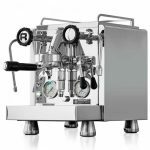 This adjustable progressive pre-infusion cylinder offers a wide variation of starting pressures to play with.This system can be retrofitted to most existing machines. All our machines are made from high grade stainless steel. 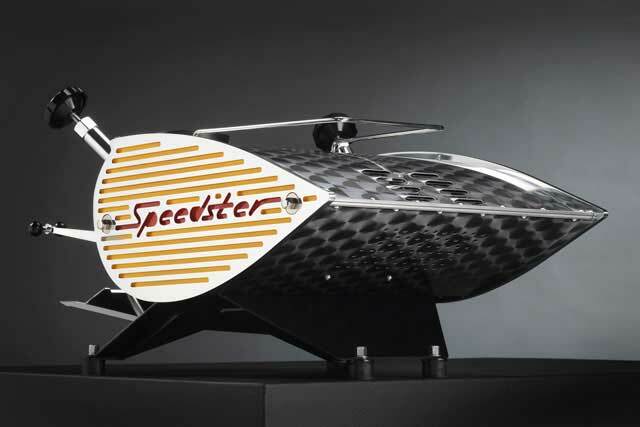 The body panels can be engine turned to stand out in any environment. The stainless steel body panels are finished with a crackle black powder coating. This durable finish creates a striking contrast between the bodywork and the polished parts. 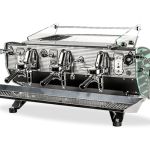 The stainless steel body panels can be coated with a RAL colour of your choice, and in the finish of your choice, smooth or textured, and gloss, silk or matt. Before being polished the aircraft grade aluminium side panels are milled and coloured. This rigid finish creates a striking contrast between the body panels and the high gloss parts. Before being polished the aircraft grade aluminium side panels are milled and coloured in a RAL colour of your liking.